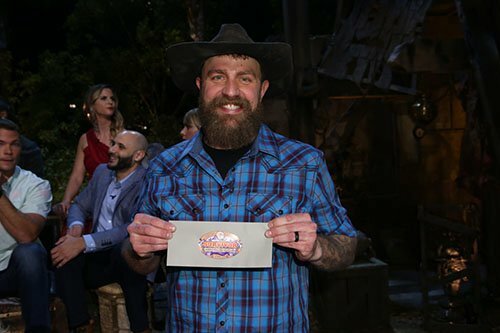 It was a great but short lived rivalry, as Boston Rob aka Rob Mariano was defeated this week by Russell Hantz in Survivor Heroes Vs. Villains. In a new interview with PopWatch, Rob speaks out on Tyson’s dumb move, Coach’s betrayal, and his thoughts on Russell as a player. ENTERTAINMENT WEEKLY: Point blank: Did Russell outplay you? ROB MARIANO: Did Russell outplay me? It seems as if Russell got the better of me. At the end of the day, he was able to convince Jerri to vote with him and Coach didn’t stand up and do what he said he was going to do, and therefore I’m sitting here talking to you. Russell — very entertaining, I give him credit. I wouldn’t want him on my team ever! I wanted him gone from the outset. But I’m the one here talking to you, so he got me. How much of an advantage do you think he had with no one having seen him play before? Well, it cuts both ways. He has an advantage in that people are gonna give him the benefit of the doubt. Myself, I realized that 20 seasons in, you have 10 people that are considered the most villainous to ever play the game, and here’s a guy from the most recent season, so he had to do something so outlandish to get picked over all those other contestants. So to me, it’s a no brainer. This kid, you got to keep an eye on him. And then when you look at him and he looks at you with those beady eyes and doesn’t blink, and can’t give you a straight answer — look, I played poker. I can read him. I knew he was bad for business. But at the end of the day, he got me, so I can’t give it to him too hard about it. Coach actually appeared to take the easiest path possible in not voting for you, yet casting a vote that he knew ensured you going home. That seems like he was almost trying to not own up to his decision. I think he’s a guy that was conflicted and he didn’t have it in him to do the right thing in this situation. So, it’s bad for me because it makes me go home, but he’s the one who has to live with it. Essentially, the turning point for me was not even that, it was the week before with Tyson switching his vote. Because here it is, Dalton: You lay out a foolproof plan, it can’t fail, there’s no way anybody in our alliance goes home, there’s no way Coach or Jerri are at risk, and you go another way for what reason? It doesn’t make any sense to me. Look, Russell took a shot. It was a gamble. It was a big gamble, it paid off and it makes him look great. It doesn’t necessarily mean that his play was correct. In poker, you can do the right thing and still lose. He did the wrong thing and ended up winning and looks like a genius, but in actuality it’s not a play I will ever make myself or applaud. But having said, that I’m the one sitting here and he’s still in the game, so I can’t take that away from him. What’s the first thing you said to Tyson when you met up with him at Ponderosa? 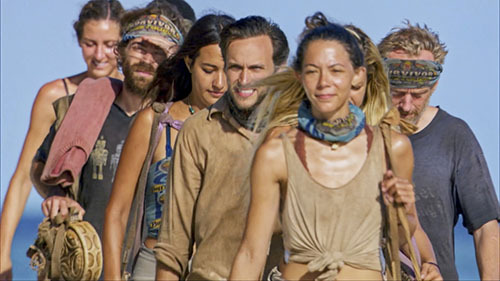 Us: Have you and Amber already blown through the $1 million winnings from Survivor: All Stars? Well, we paid our taxes, bought a house, put money away for our daughter and lost money in the stock market like everybody else. So yes! Us: Your five-year wedding anniversary is April 16. What have you got planned? We have a tradition of spending it at the beach. We met on a beach and got married on a beach. I just don’t know which beach we’re going to yet. But for the first time, there will be three of us. Us: How is parenthood going? I love it. Amber loves it. Lucia turns nine months on Sunday and she’s getting big! She’s crawling and getting ready to take her first steps. She’ll go from the coffee table to the ottman but doesn’t have the courage to let go yet.